One can be forgiven for doubting that Kim Jong-un is an “absolutely competent and mature politician,” as Russian President Vladimir Putin has called him. He is rather a cold cynic risking the lives of millions of people to secure his own political survival. Indeed, the sole reason he is amassing a nuclear arsenal is to forestall meeting to same fate as Saddam Hussein or Muammar al-Gaddafi. He is striving for unassailability. 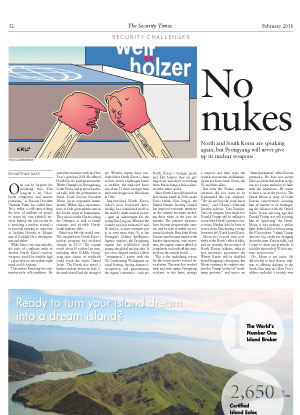 While Kim is not unassailable, the price of a military strike to destroy North Korea’s nuclear weapons would be terribly high – a price that no one in their right mind could condone. That makes Kim Jong-un commensurately self-confident. He seized the initiative with his New Year’s speech in 2018. He offered North Korea’s participation in the Winter Olympics in Pyeongchang, South Korea, and proposed political talks with the government in Seoul. South Korean President Moon Jae-in responded immediately. Within days, representatives of both governments met in the border town of Panmunjom. They discussed the North joining the Olympics as well as family reunions and possible North- South military talks. Relief was felt the world over. The standoff over North Korea’s nuclear program had escalated sharply in 2017. The regime tested about 20 rockets last year, including three ICBMs. Pyongyang now claims its warheads could reach the entire United States. The North also tested a further nuclear device on Sept. 3, the sixth overall and the strongest yet. Western experts have concluded that North Korea’s claim to have tested a hydrogen bomb is credible; the explosive force was about 15 times stronger than the bomb dropped on Hiroshima in 1945. 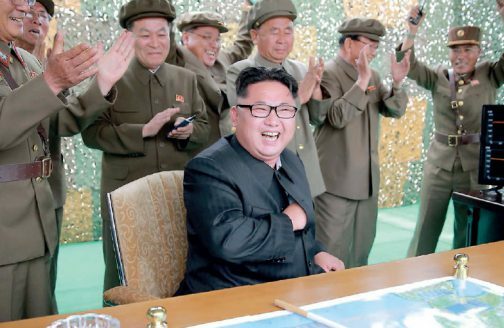 Impoverished North Korea, today’s most backward dictatorship, has established itself as the world’s ninth nuclear power – quite an achievement for the young Kim Jong-un. Whether the country now has between 20 and 30 devices, as most estimates put it, or even more than 50, as the Pentagon’s Defense Intelligence Agency suspects, the Pyongyang regime has established itself among the global nuclear elite. It has even claimed nuclear (albeit “asymmetric”) parity with the US. Confronting Washington on equal footing, forcing America’s recognition and guaranteeing the regime’s existence – such are North Korea’s strategic goals, and Kim believes they are getting closer and closer to reaching them. But in doing so he has alienated the entire world. Since North Korea detonated its first atomic bomb in 2006 under Kim’s father, Kim Jong-il, the United Nations Security Council has imposed economic sanctions on the country ten times, including three times in the past six months. The punitive measures have become progressively onerous and by now resemble an economic blockade. Even if the North Koreans have become inured to the hardest deprivations, even starvation, the regime cannot afford to completely seal itself off the country from the outside world. This is the underlying reason for the recent moves toward de-escalation. The tactic has worked time and time again: Pyongyang escalates to the limit, springs a surprise and then reaps the rewards in economic and humanitarian aid from South Korea, the US and their allies. But even the Obama administration did not want to be blackmailed this way anymore. “We do not buy the same horse twice,” said Obama’s National Security Advisor Tom Donilon. One can imagine how much less Donald Trump will be willing to reward the North’s putative concessions. Neither does he have to worry about Kim driving a wedge between the US and South Korea. No, Moon is not naïve. He did not fail to hear that in addition to offering dialogue to the South, Kim Jong-un’s New Year’s address included a second, very different message aimed at the US: North Korea, now established as a nuclear power, will mass-produce nuclear warheads and ballistic missiles in 2018. For Mullen, Trump’s martial rhetoric shares responsibility for escalating the conflict. It was Trump who threatened “fire and fury” last summer, who warned the UN to “totally destroy” North Korea and accused “little rocket man” Kim of embarking on a suicide mission. “I’m just more inclined to see over time that the rhetoric seems to be where the President is,” Mullen said in his television interview. In the conflict with North Korea, Washington has not taken the military option off the table. On the contrary, talk of a preemptive strike became louder at year’s end. Some planners in the Pentagon apparently believe that a war can be limited, that it need not inevitably extend to the whole region, let alone escalate to nuclear war. Targeted military strikes, a “kick in the shin” and a “bloody nose” are topics of discussion in Washington. For some time now, South Korean and US special forces have been training for a “decapitation strike” against the North Korean regime. As realistic as such scenarios may be, the idea of a “surgical strike” has proven often enough to be pure illusion. While the US and allied forces are vastly superior to those of the North, and their victory would be a foregone conclusion, the consequences of a war remain incalculable. Not only does the North have 1.2 million soldiers under arms and some 13,500 artillery pieces aimed at the south, these are also aimed directly at Seoul, just 30 miles from the border and home to 10 million inhabitants, with 15 million more living close by. Even if the US could use a preemptive strike to destroy all North Korea’s nuclear weapons – a highly unlikely prospect – and eliminated most its artillery – nearly impossible – they still have large stocks of chemical and probably biological weapons. It would still be Armageddon. So, war on the Korean Peninsula is not an option. What is promising, however, is the current strategy of “maximum pressure” through economic sanctions and political isolation. But success is contingent on the dogged cooperation of all parties – the Americans, South Koreans, Chinese, Russians and Europeans. is an international correspondent for the German weekly Die Zeit and author of Countdown in Korea, published in 2017.